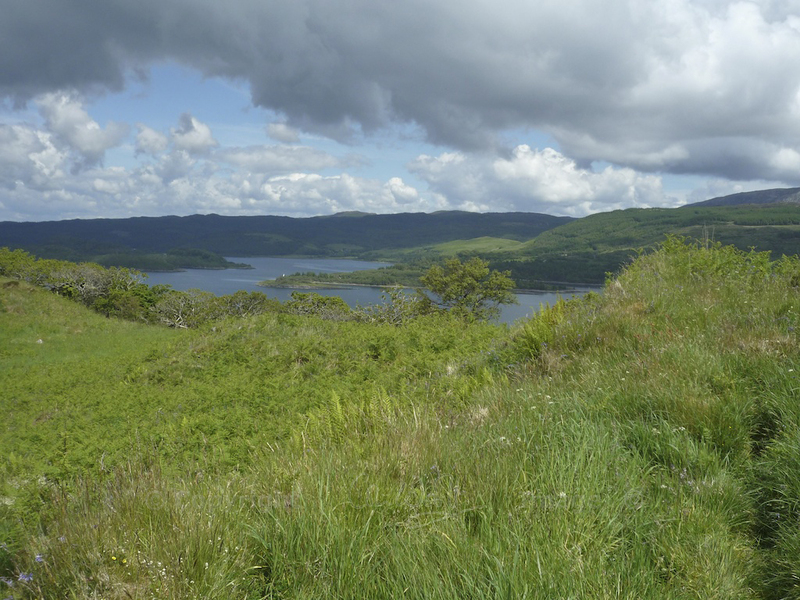 Divided by the wide expanse of Loch Caolisport, Knapdale in Argyll is a landscape of low wooded hills, windswept areas of rough grassland and bracken, and patches of peat bog with reedy lochans. The country is gentle and muted, with the sea not far away in either direction; prone to mists and fine drizzle, its mild climate allows lichen and mosses to run riot. The old oak trees are alive with songbirds in spring and summer, and the woodland floor is speckled with the white stars of wood sorrel and windflowers. A minor roa d with passing places threads its way around the sea lochs, taking you through a number of villages that consist of nothing more than a few low-roofed cottages overlooking the shore. You might not see a soul, and you might not even meet a car; there’s a sense of going back in time, but it’s more subtle even than that, almost as if the past and present are one and the same: like the ivy that smothers the crumbling walls of abandoned bothies, blurring the lines, blending the living with the dead. 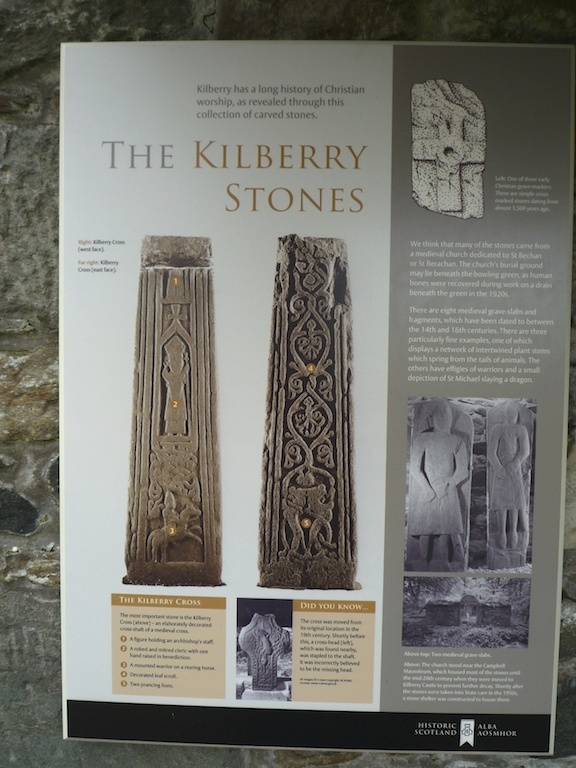 It was in this pleasant trance-like state, as we were driving around Knapdale a couple of years ago, that I glimpsed a roadside sign bearing the words ‘Kilberry Sculptured Stones’. This woke me up, because it is the kind of sign I like to see. As we headed up the narrow track we felt a little as though we were trespassing, because in fact this lane is also the private driveway of Kilberry Castle. 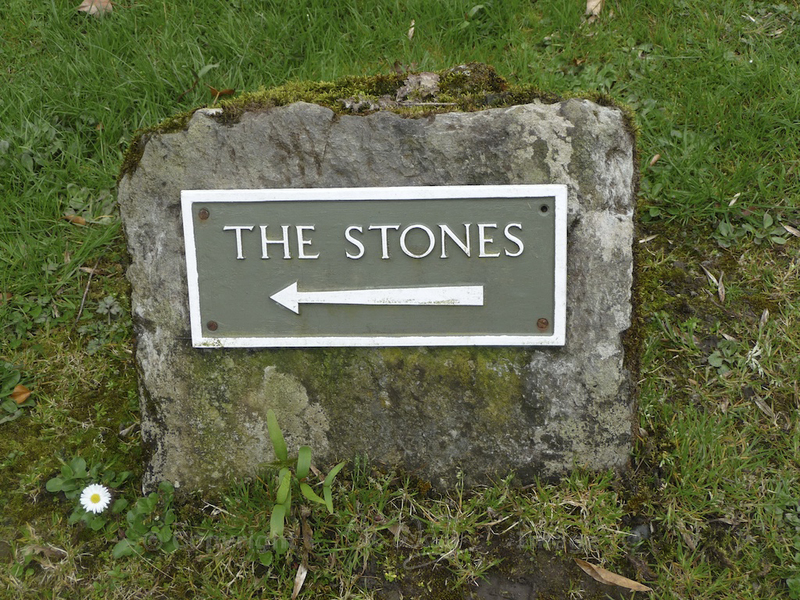 However, there is a small car park for visitors, and another sign which points reassuringly to ‘The Stones’. 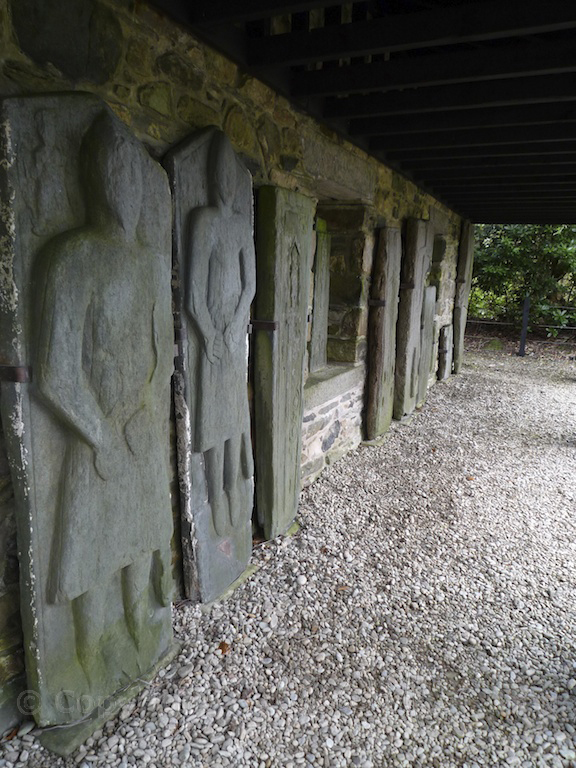 We certainly didn’t have to walk far to see them: neatly arranged and lined up, protected by a specially-designed building that shelters them from the worst of the weather, are enough wonderfully carved grave slabs to satisfy the most stone-hungry traveller. The oldest examples are fragments, incised with simple crosses, and these date from the early Christian period – in other words, the sixth or seventh centuries AD. 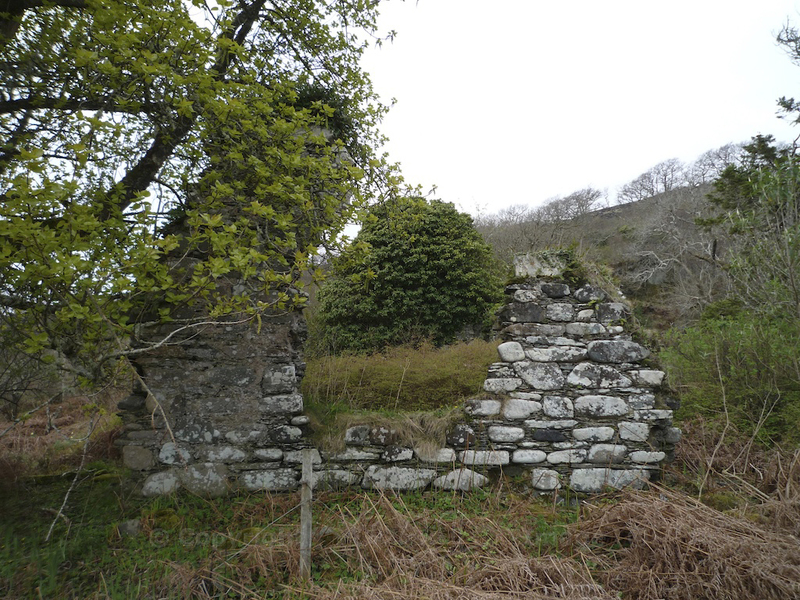 Apparently there was an ancient church nearby, of which nothing now remains; this was dedicated to St Berchan, a little-known Irish missionary whose name has mutated through Beryan and Berry to form part of the present name of the village: Kilberry, or the church (in Gaelic, ‘cille’) of St Berchan. 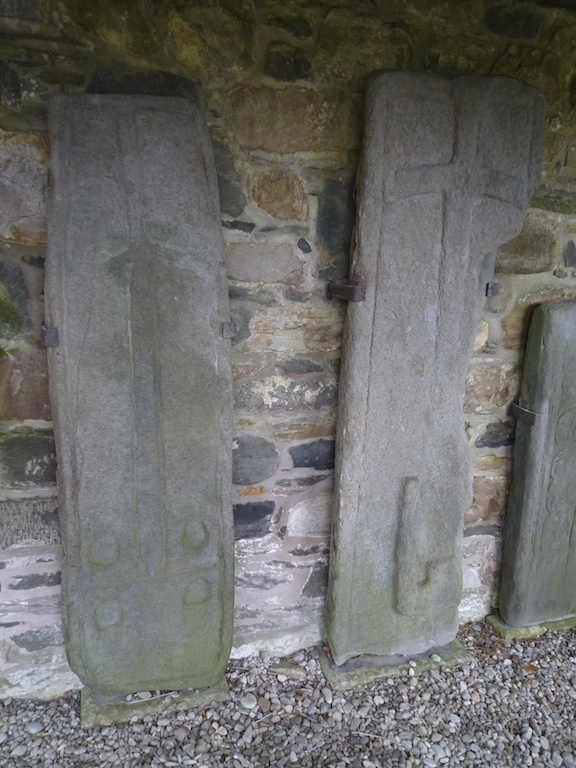 The early grave markers at Kilberry are contemporary with the beautiful stones of a similar design at Kilmory Knap (Kilmory meaning ‘the church of St Maelrubha’) which lies a few miles to the north. The surfaces of the effigies have been worn smooth, and I could not see any inscriptions revealing their identity, so I can only assume they have been lost since the words were recorded. The above description refers to a custom among medieval Templar knights. 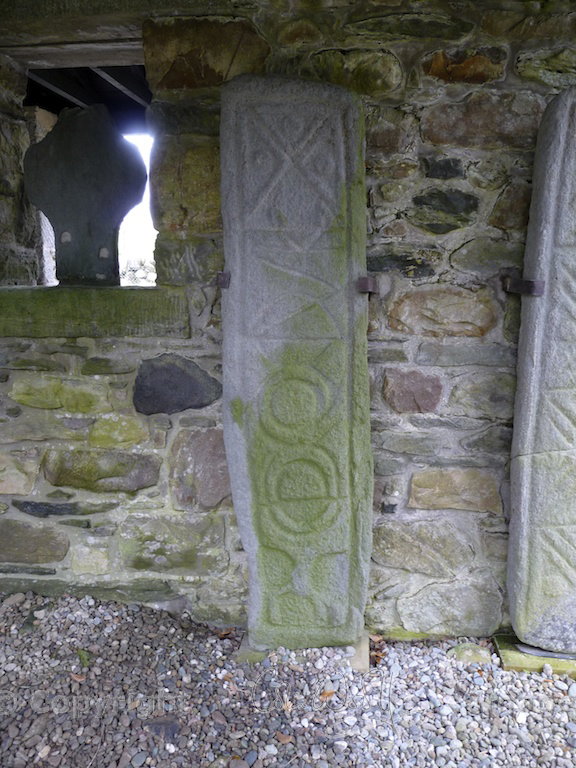 I have already mentioned the presence of Templar-like symbols on stones at Kilmory Knap Chapel. 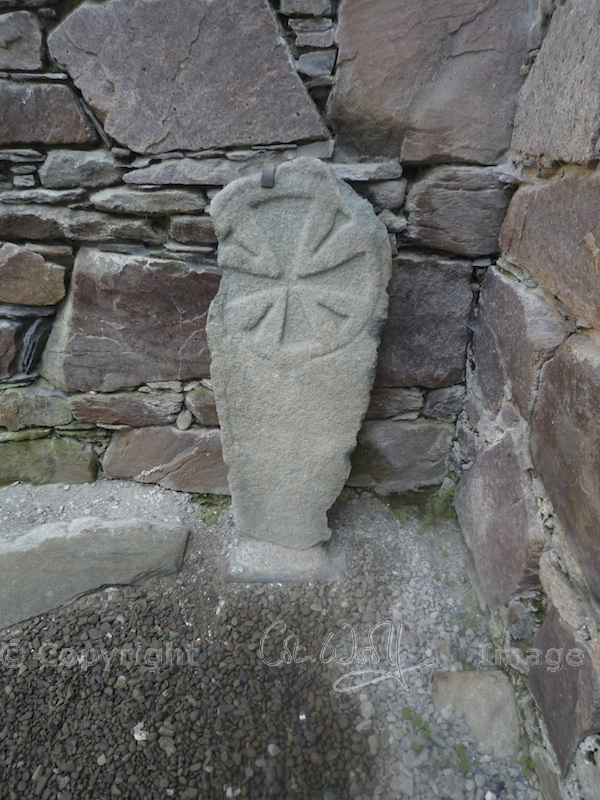 I think I can detect a similar ‘cross pattée’ here at Kilberry, on a stone that looks very much like a marker singled out by historians Michael Baigent and Richard Leigh as being indicative of a Templar site. And here is one that I photographed at Kilberry. To me, the similarity is quite striking, although I am prepared to admit that I’ve probably entered the realms of fantasy! The presence of Knights Templar in such a remote part of the Scottish coast is perhaps not as unlikely as it first appears: it has a lot to do with Ireland, Pope Clement V, illegal weaponry, and Robert the Bruce. 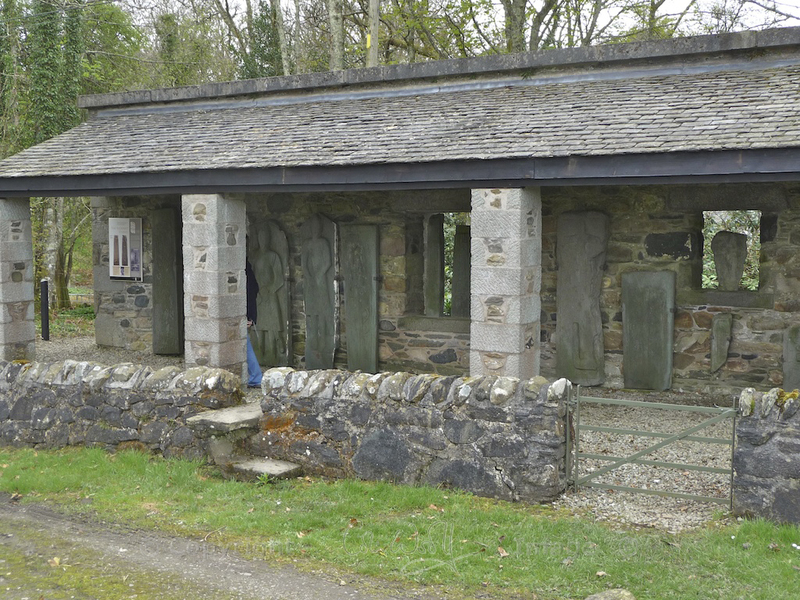 It’s a totally fascinating story, and I will refer you to my earlier article on Kilmory Knap Chapel if you want to know more! 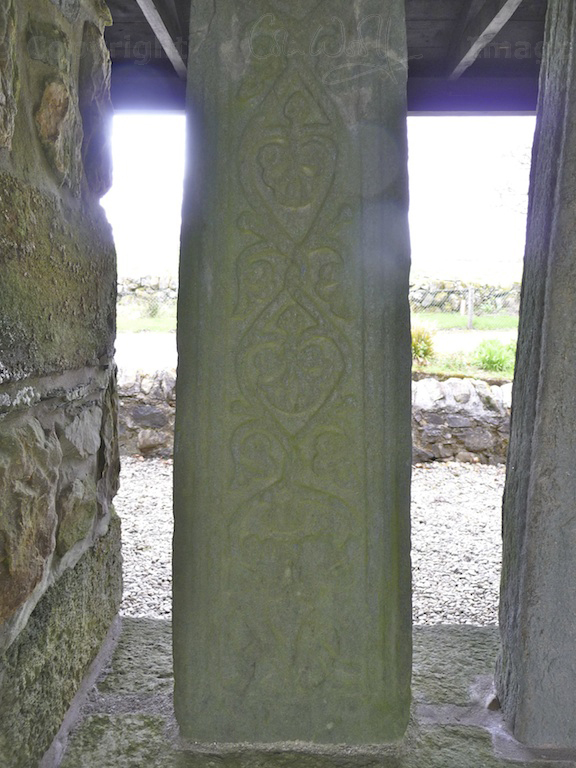 Set into a recess in the central wall of the shelter is the Kilberry Cross. Dating from the 14th or 15th century, this is the centrepiece of the exhibition, but you might be forgiven for passing it by. It doesn’t look like a cross at all, and this is because only the shaft remains: the cross-head could be buried in any of the surrounding woods or fields. But we still have much to look at in the cross shaft. Standing just over three feet tall, it is both a work of art and a snapshot of medieval life. On one side it is embellished with inter-twined stems and foliage, at the base of which are what Historic Scotland describes as “a pair of back-to-back prancing lions”. These have been eroded so much that it requires a certain degree of imagination to appreciate them. Here is a photo of the Historic Scotland sign, which shows them in better detail (white background, right-hand stone). The other side is even more intriguing. Carved at the bottom is a warrior astride a rearing horse, and the figure above him looks like a bishop wearing a robe and mitre. At the top is a third figure, partly eroded, holding an archbishop’s staff. (I am relying on Historic Scotland for the last details, because the top figure is so badly damaged). Who is the man on horseback? Based on the story of MacMillan’s Cross, my theory is that this monument might have been erected by a local chieftain or landowner – perhaps one of the MacMurachies – who is portrayed as the mounted warrior being blessed with good fortune by the clergymen. This carving of the Crucifixion was originally thought to be the broken head of the Kilberry Cross, and was stapled to the shaft, but this idea has now been disproved and the pieces have been separated. A family mausoleum was built in the Castle grounds in 1735, and some of the grave slabs and markers were incorporated into the walls of this building. There’s something tantalising about the old man’s recollections, because they are unique and indisputable. In the case of Kilberry, they may be our only window into an ancient past that is now lost to living memory. This should be a lesson to us all: in this era of instant communication, we have abandoned the tradition of handing down stories from generation to generation. We have broken the thread. The Druids had it right after all. 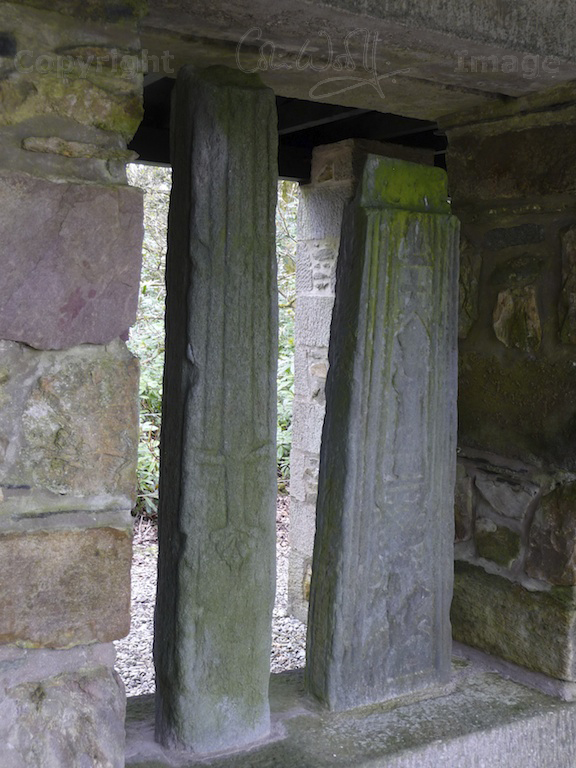 There are over 20 carved stones at Kilberry, including the cross-shaft, and they were moved to their present site in the 1950s. There is free admission if you wish to go and see them, but as far as I know, there is no public access to the Castle or the mausoleum. 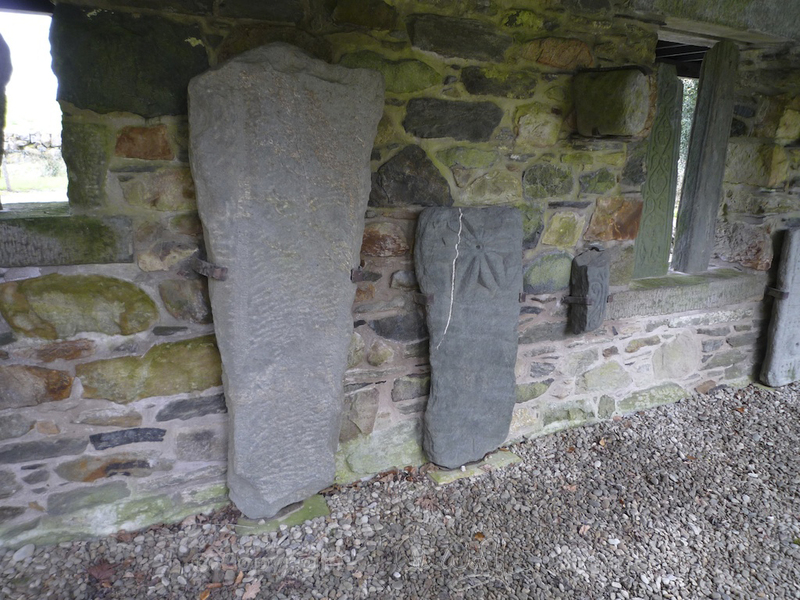 Visiting the sculptured stones at Kilberry is a different experience from, say, opening the door to Kilmory Knap Chapel and being quietly awe-struck by its contents. There’s no lingering atmosphere of reverence, despite the fact that you are likely to have the place all to yourself. 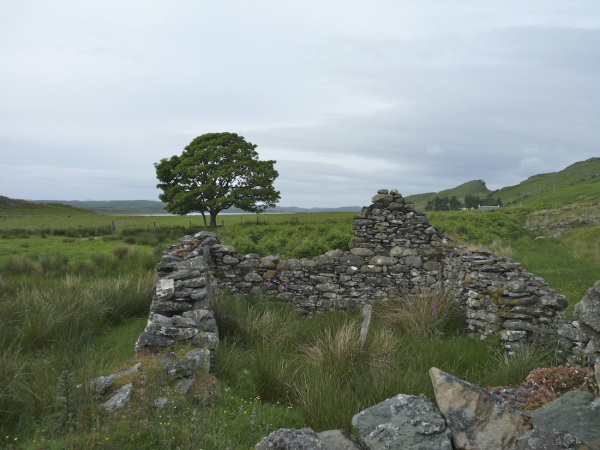 But there is a deep and natural tranquillity, and that is more to do with the character of Knapdale; a hermit looking for isolation and solace would still find it here. In the 7th century, what on earth inspired the likes of St Berchan, St Brendan, St Columba and their contemporaries to take the daring step of forging a new life for themselves across the Irish Sea? Was it really a determined bid to convert the Picts to Christianity? The alluring chance to become a saint of their time? To see their name in an illuminated manuscript? Or was there something more? This is something I’ve always been fascinated to know. You might like to take a look at these features about Kilmory Knap Chapel on Loch Sween, just a few miles (by water) away from Kilberry. 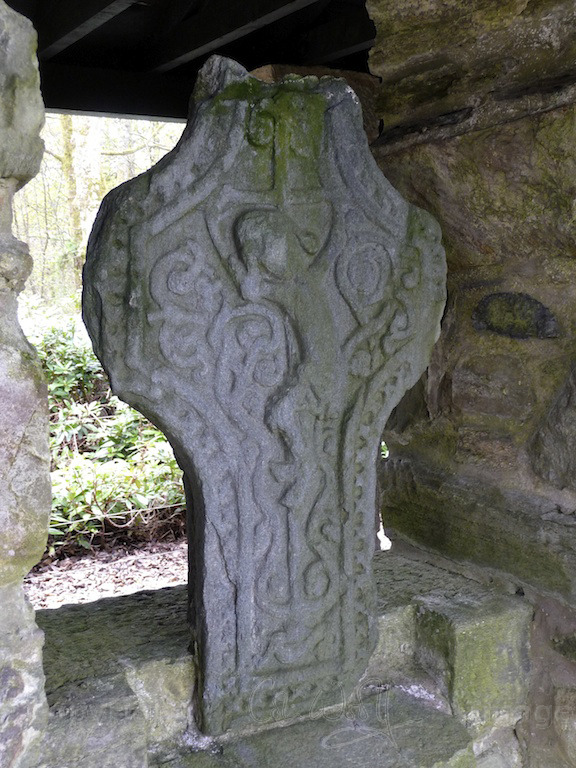 …while the second feature takes a longer look at the interesting stories behind some of the stones, including the impressive MacMillan’s Cross. Thank you, Lynne! It’s quite exciting to discover signs of the Knights Templar, for some reason I can’t explain! Having read some of Baigent and Leigh’s book I now want to read about more Templar-related places – this is a fascinating story, even if it’s only conjecture! More amazing carvings, although the mention of prancing lions reminds me of the eye of faith you need to see some of the animals found in constellations. I sometimes wonder about the way we accumulate information now, will it be accessible in the future? So much is recorded in various forms of media but a lot of it is conjecture, hype and spin. Anyone in the future looking for established facts about our times might find it quite a tiresome task. Yes, that’s very true! Constellations are the worst – I always imagine they were dreamed up by ancient people who had drunk a bit too much mead. As you say, I think information overload will be the problem in centuries to come – and how to find the truth. Wonderful history & wonderful pictures too. Your posts really make me want to explore more. Thank you. Thank you very much, Ash. I am glad it inspires you to visit these places – writing about Kilberry made me want to go back there, too. It looks as if it has a lone and solitary wind-swept feel to it. Kind of a brooding restlessness feeling from the photo’s. Did it feel that way when you were there? What an interesting place. It is certainly a windswept peninsula, and the ruined bothies dotted about give it an abandoned feel. There is always a kind of sadness about these, because of the Clearances, although not all the ruined buildings date from that time. The top photo was taken in the middle of summer, on a different day from the others, and it is amazing how much difference the sun’s warmth can make to your experience of a place! The impression I get of Knapdale and Kintyre as a whole is one of peace and a slower pace of life, perfectly in tune with nature. Thank you for another magical journey, Jo! Lovely photos…it’s just amazing to think that those swords are LIFE SIZE. When you see them in person, it is terribly hard to imagine picking one up, much less carrying one around and using it. Perhaps those Claymore/sword carvings were the early Scots version of “fishing stories” (you should have seen the one that got away!) but I’m guessing not. Also, on one of the effigies, you can clearly see the fellow is holding his dagger with the clasped fingertips facing the viewer. This stance seems somehow more alive, and definitely a person to pay attention to! Thank you very much, Hank, for the lovely comment! 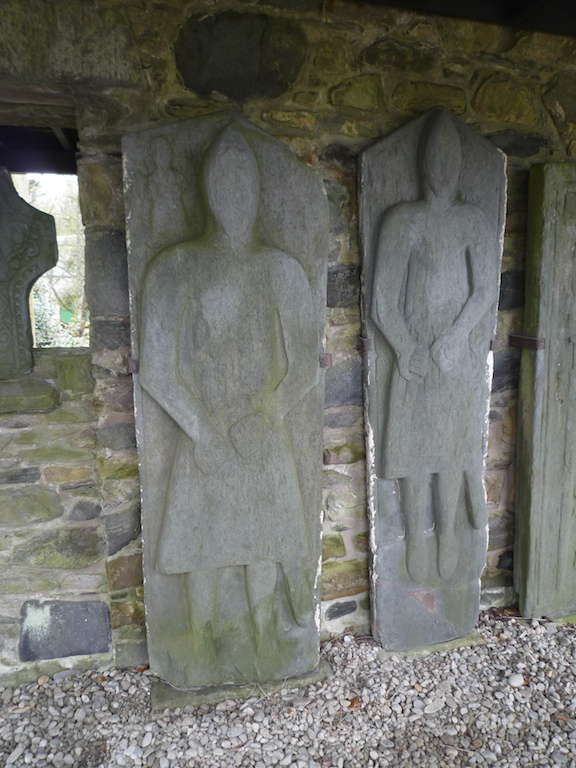 I noticed that about the swords too, and the unusual pose of their right hands – at Kilmory there is a graveslab of a knight in the same pose, with a better-defined dagger. And yes, if the swords are life size, they boggle your mind. There is an old sword preserved at the Wallace Monument in Stirling (I haven’t seen it myself) that is reputed to have belonged to William Wallace, although some historians disagree. It is 5’6″ long including the hilt, which means that Wallace must have been a giant of a guy. I thoroughly enjoyed this post Jo, it has all the elements I love – history and mystery! Medieval swords really were huge – I remember seeing some at Warwick Castle many years ago and being amazed at the size – no wonder knights spent so much time exercising – they’d have needed to be very fit indeed to wield those weapons. I have been on the path of the Knights Templar in Jerusalem and Acre (Akko), Israel, but nothing compares in local richness to these small and beautiful churches, full of magnificent slabs and carvings in such a calm atmosphere. Actually, the Knights Templar took their name after their first headquarters on the Temple Mount in Jerusalem, which they called the Temple of Solomon. This is one of the most exquisite architectural masterpieces in Israel. Truly enjoyed this and both parts of the related posts. Wonderful imagery and tales, Jo!. Wow, you mean you have travelled there? That sounds like an amazing trip. Yes, I have read a bit about the Temple of Solomon, and what little is left of it. The whole story of the Templars is intriguing. Thank you very much – I’m glad you enjoyed this, and I know you would love these little churches and their surroundings. There are traditions way before the old man. In respect of this site, one is that the MacMurachies were the MacMhuirich bards to the Lords of the Isles and that the ‘monastery’ was their bardic school. This would fit with the 14/15th century date of the stones and with the Historic Scotland tanslation of Latin Mauritius as Muiredach. That’s very interesting! It all seems to fit and I can well believe it. Thank you for sharing this. Have you made a study of this area or this place? Was at the Stones yesterday. You have hit it “square on the head”! Wonderful, evocative writing. Thanks for the detailed descriptions. I have bookmarked your site in our Scotland folder. Hi Jo, I visited the Kilberry stones when I was a boy some sixty years ago. I have to confess that at that time and age I was not as interested in them as I am now. However there was one stone that did capture my imagination and has lived in my memory ever since. That one was the “Manhood stone” and I was wondering why there seems to be no mention of it. Perhaps it did not actually form a true part of the collection and was subsequently removed. Do you have any knowledge of it? Wow, how very interesting! No, I’ve never heard of the Manhood stone. I shall have to see if I can find out more! If I do, I shall let you know. Thanks for your comment, Lan! 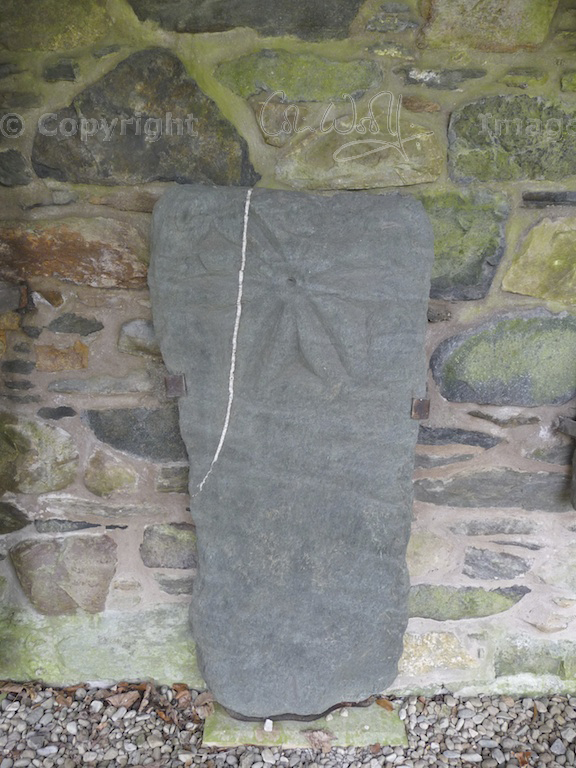 Further to my earlier comment, I have found this blog post which is a few years old, about ‘lifting stones’ around Scotland. I knew nothing about these! Apparently a man called Peter Martin was researching them, but from another source I have now found that he has since passed away. 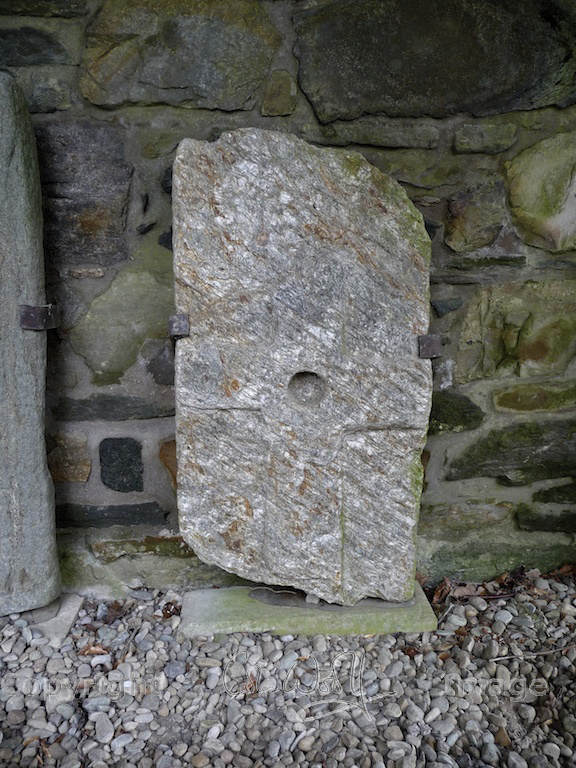 http://kilchoan.blogspot.co.uk/2012/03/lifting-stones-1.html It sounds likely that the stone you saw at Kilberry was one of these, and may now be lost or moved. At one time, there were a lot of these stones scattered around the place, but known to the local population. The trouble now is that identifying such stones is a bit of a problem! It seems that some of the surviving ones are still used in strongman competitions. But how interesting. I also read that this old tradition is echoed in modern gateposts with the spherical balls atop the pillars! Peter Martin wrote a book called ‘Of Stones and Strength’, cataloguing the many stones he found, which may be worth reading if you would like to pursue it further. Hi Jo, thank you for the information. I was brought up in the first house up the Kilberry Road and I return to Mid Argyll for holidays. Next time I am there I will make some enquiries of old friends to see if I can find out what happened to this stone. If I manage to get any information as to its whereabouts and/or its history I will post here. That would be fantastic, thanks Lan! What a lovely place to grow up – so unspoilt and very beautiful.